Gabriella DeMartino posted some pictures on instagram wearing a Fashion Nova Over It Faux Fur Jacket ($59.99), a Coach Mason Carryall Tea Rose Tote Bag ($795.00), Henri Bendel Luxe Asscher Cut Crystal Stud Earrings (Sold Out), the Hermès Clic H Bracelet ($600.00) and Louis Vuitton Star Trail Ankle Boots ($1,360.00). Skai Jackson attended the Variety’s annual ‘Power of Young Hollywood’ last night wearing Vivienne Tam Spring 2018 (Not available online), Henri Bendel Luxe Asscher Cut Pave Studs ($98.00), Gabriel & Co. 14k White Gold Cushion Halo Round Diamond Studs ($650.00) and Charles by Charles David Royalty Open-Toe Button Bootie (Sold Out). Lucy Hale was spotted out and about in Studio City wearing a Reformation Coconut Jumpsuit ($178.00), a Henri Bendel Crosby Mini Zip Crossbody Bag (Sold Out), Garrett Leight Wilson Sunglasses ($365.00) and Koio Gavia Bianco Sneakers ($248.00). Gabriella DeMartino attended her best friend’s baby shower wearing an ASOS Design Midi Mixed Print Pretty Tea Dress ($66.32), Miu Miu Crystal-Embellished Madras Leather Shoulder Bag ($2,100.00), Henri Bendel Asscher Cut Pave Studs ($98.00), a Tiffany & Co. T Two Ring Silver and Rose Gold Ring ($495.00) and Ted Baker Ichlibi Bow Pumps ($107.44 – similar style). Gabriella DeMartino posted some pictures on her instagram stories wearing a SHEIN Applique Mesh Sleeve Bow Embellished Dress ($27.00), a Tiffany & Co. T Two Ring Silver and Rose Gold Ring ($495.00), a Cartier Love Wedding Band Ring ($1,070.00), Henri Bendel Pave Halo Studs ($98.00), a Tiffany & Co. Return to Tiffany Heart Tag Pendant Necklace ($600.00) and Steve Madden Scarlett Sandals ($84.99 – wrong color). Gabriella DeMartino celebrated her 23rd birthday wearing an Embellished High-Neck Blouse ($130.00) and Sasha Flippy Shorts ($45.00) both by Topshop, Henri Bendel Pave Halo Studs ($98.00), and Christian Louboutin Iriza Patent Pumps ($725.00). Gabriella DeMartino shared a new fancy vlog today modeling some fall outfits. 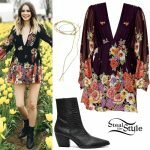 In the first shot Gabi is wearing a Star Ruffles Backless Mini Dress ($22.99) and Zipper Striped Peep Toe Ankle Boots ($34.96) both by Zaful, a Luxe Asscher Cut Petite Cuff ($39.20) and a Rivet Bangle ($118.00) both by Henri Bendel. 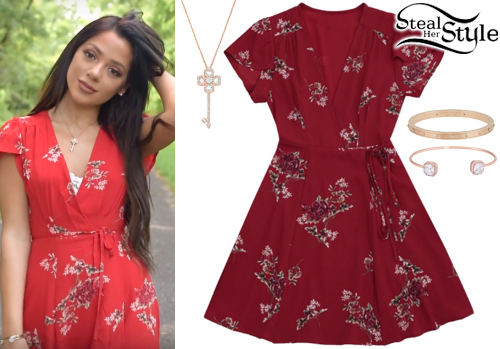 In the next shot, Gabi is seen wearing a Zaful Floral Cap Sleeve Wrap Dress ($18.99), a Swarovski Deary Key Pendant ($129.00), a Luxe Asscher Cut Petite Cuff ($39.20) and a Rivet Bangle ($118.00) both by Henri Bendel. In another shot, Gabriella wore a Zaful Zipper Checked Slip Mini Dress ($15.59), a Gucci Leather Belt with Interlocking G ($375.00), Swarovski Deary Key Pendant ($129.00), a Luxe Asscher Cut Petite Cuff ($39.20) and a Rivet Bangle ($118.00) both by Henri Bendel. In the last shot, Gabriella is seen wearing a Zaful Woolen Double-Breasted Coat ($64.99), Burberry Ombre Washed Check Silk Scarf ($450.00) and Stuart Weitzman Highland Over-The-Knee Boots ($450.00). Gabriella DeMartino posted a picture on instagram today wearing an Agent Provocateur Audrey Bra ($215.00), Line And Dot Flora Blazer ($108.00), a Luxe Asscher Cut Petite Cuff ($39.20) and a Rivet Bangle ($118.00) both by Henri Bendel, Chanel Swarovski Crystal Logo Earrings ($490.00 – preowned), a Cartier Love Pink Gold Wedding Band ($1,070.00), her Louis Vuitton Neverful MM Bag ($1,290.00) and BCBGMAXAZRIA Opia Lace Pumps (Sold Out). Gabriella DeMartino posted a picture on her instagram stories today wearing a Vintage Chanel Eloise Silk Dress (Sold Out), the Wildflower Cases Rosy iPhone 6 Plus Case ($37.00), a a Henri Bendel Luxe Asscher Cut Petite Cuff ($39.20) and Gucci Bow Leather Pumps ($950.00). Brenna D’Amico arrived at the premiere of Descendants 2 on Tuesday wearing an Aidan by Aidan Mattox Printed Organza V Neck Party Dress ($144.22), a Blumera Stingray Box Clutch ($1,300), Henri Bendel Luxe Uptown Linear Earrings ($47.20), a Native Gem Enchanted Snake 14K Rose Vermeil Ring ($99.00) and Christina Lombardi Kersen Pony Hair Pumps ($395.00).